Led by a school-record smallbore effort, several all-OVC caliber performances and individual school records too, Morehead State rifle completed the 2019 OVC Championships this weekend in second place with a 4,666 aggregate score, just one short of the school overall record. Junior Alexa Potts was named First-Team All-OVC in smallbore and air rifle and tied the school record for air rifle individual score (594) while setting the smallbore individual prone score (200 with 19 center shots) and the aggregate school record of 1,180. She broke that mark by eight points, previously held by former teammate Joe Fischer. It marks the second straight season for the Eagles to claim second place overall, a feat that had never been accomplished in program history prior to 2018. Murray State won its fourth consecutive title but only by 19 points ahead of Morehead State. Senior Brandon Bryer was tabbed First-Team All-OVC in smallbore and Second-Team All-Conference in air rifle, while freshman Erin Diehl earned a spot on the OVC Smallbore All-Newcomer Team. Head coach Alan Joseph was voted by his peers as the league's co-Coach of the Year as well. 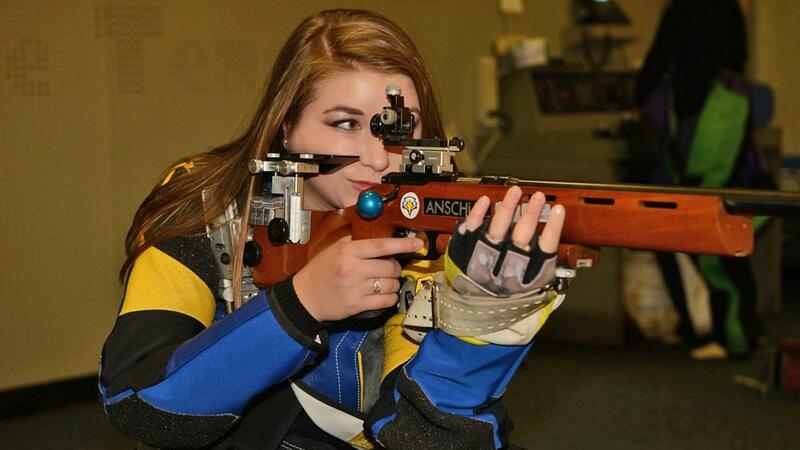 On Saturday, Morehead State fired a school-record 2,320 in smallbore, led by Potts' 586. She tied her personal best in kneeling with a 198. Diehl contributed with a personal-best 197 in prone. Sophomore Ryan Hinson was nearly perfect with a personal standard 200 in prone with 16 center shots, while freshman Katie Frye tied her standing best at 188. Bryer totaled a 580 on the day, while Diehl, Frye and Hinson recorded 577 scores. The Eagles completed the event with a 2,346 in air rifle on Sunday. Bryer notched a 585 with fellow senior Siarra Crum coming in with a 584. Hinson tallied a 583. Morehead State will complete its regular season the next two weekends, hosting Jacksonville State Feb. 9 and shooting at Kentucky for the NCAA Qualifier match on Feb. 16. Led by a combined personal best-day from junior Alexa Potts, the Morehead State Rifle team opened the 2019 portion of the 2018-19 schedule with a 4,638-4,467 win at Virginia Military Institute Saturday. The Eagles also topped the VMI women's-only club, which scored a 4,351. The Eagles are now 6-0 in dual matches. Potts fired a team-best 590 in air and added a 576 in smallbore (tying her career high) for a combined personal-best of 1166. Among her scores were a personal-best in kneeling, at 198 while tying her prone high-water mark of 197. Morehead State rifle capped a tremendous weekend by setting school record for smallbore, smallbore standing and overall score and defeating Georgia Southern Saturday at Button Range. The Eagles' 4,667 total broke the previous mark of 4,659. MSU also edged the old smallbore record by one point, scoring a 2,314 today. The team set the standing mark with a 763. In addition, freshman Erin Diehl established the school record for standing smallbore with a 194 and topping the previous mark by one.